There is no better way to cool down from sizzling temperatures than taking a ride on the raging water’s rapids. Yes, there’s something about flying down a river and taking on Mother Nature that seems to appeal to the masses. 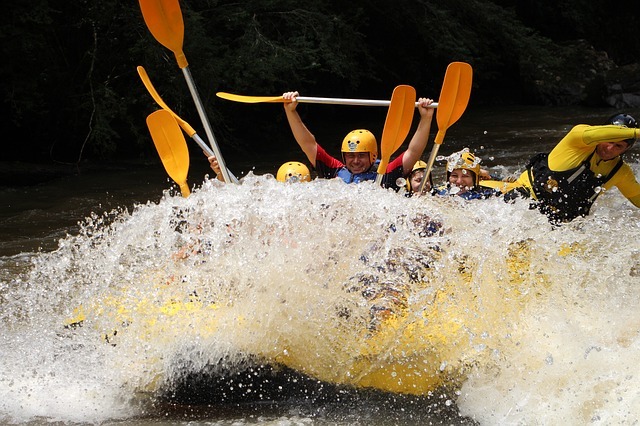 If you have considered white water rafting but still have your doubts, here are six reasons why you will fall in love with this extreme sport. Most people love to brave the elements in a “man versus nature” type of battle. Some of the greatest movies and books have retold the story of people braving nature and their survival. Though this is a bit tamer than some of nature’s fury, it certainly is a sport that is not for the weak of heart. The waters swirls and crests giving thrill seekers a trip they’ll never forget. If you love roller coasters, then there is no doubt you will love the rapids. Those intense climaxes that have your stomach in knots can be felt on the waters too. The body pumps adrenaline giving you a euphoric feeling that you can conquer the world. If you are a dare-devil risk jockey, you won’t want to miss this ride. When considering a white water rapids trip, you must consider the amazing people that you will meet. Those who take these types of trips are the ones who have love the thrill of adventure too. You will get to be up-close-and-personal with people from all walks of life. Who knows, you may even make a new friend. Many people are attracted to this type of sport. However, the person who loves this activity the most is those who have an appreciation for water. If you are a “water baby” and want to be in and around water as much as possible, you will love the thrill of flying down the rapids with the cool mist in your face. Being in and on water is just another highlight of the adventure. One of the best reasons to hit the rapids is for the bragging rights. Why wouldn’t you want to tell everyone about your escapade? Since this is considered to be an extreme sport, you will enjoy sharing your story time and time again with those too chicken to brave the beast. Most people have some sort of physical activity they perform to keep their bodies in shape. While exercise is one thing, this takes the meaning of the word “workout” to a whole new level. Why not test your strength and endurance by seeing how much of a fighter you are? It is a chore just to stay in the boat and not be overrun by the mighty, rushing waves. Will you be strong enough to survive, or will you end up face first in the rapids? As you can see from the above-listed reasons, there are so many things about hitting the rapids that are positive. Sure, you may be a little apprehensive and wonder if you’ve lost your mind. Remember, it will be an epic journey doing an extreme sport that you will look back on with fond memories. What’s not to love about white water rafting?